Barbaric Poetries: The Uglies Dystopia: Would you choose perfection? 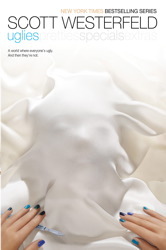 Uglies by Scott Westerfeld was a series that intrigued me back in middle school. The books are set in a society that gives the option of plastic surgery to sixteen year olds. Basically, after this extreme plastic surgery, the teenagers will have the perfect body: “big eyes, full lips, no one fat or skinny.” Along with this perfect body comes acceptance into New Pretty Town, where the new “Pretties” are free to roam and carry out risky adventures. However, along with this perfect body comes a price: brain lesions are left in the new Pretties’ brains that take away their desire to think for themselves. They have no imagination, emotions other than happiness, or wish to be different. The worst part is that no one questions this submissive behavior since the “Uglies” are shunned for their imperfections and not respected or listened to, and everyone else is “pretty-minded.” There is much more to the story, but the above summary is sufficient to make my point across. I remember being a middle schooler and picturing this dystopia as reality. What would I do? Would I be like the main character and rebel against this corrupt society? Or would I give into peer pressure and get the operation as soon as I turned sixteen? I took into account the fact that I would have been raised to not question this government as well as the strong desire I’d have to be “beautiful” like everyone else. To be completely honest, I would most likely go with the operation. Knowing this, what does this say about me? Am I easily persuaded? I would like to say that I’m not, but when literally “everybody is doing it” and you’ve known nothing else, it is hard to refuse giving in. Thus, this brings up my next point of how different is this dystopia from modern society? Yes, we must take into account that we don’t have this advanced of technology, but, as each day goes by, we make further and further progress. This possibility could very soon become a reality. In a few previous blog posts, the topic of unattainable perfection in media was mentioned. Modern day society is already obsessed with advertising this “perfect image.” Thanks to the help of photo shopping and plastic surgery, more and more people are developing mental disorders, such as anorexia and bulimia, to try and achieve this look. People are purchasing expensive products to keep their skin flawless or make their eyes and lips bigger. If this continues, we will all be soon on the crash course toward a society that could very well resemble the Uglies civilization. So the final question is: What would you do? If this operation were offered to you in the future, would you take it? The disadvantages of having the brain lesions may not be present in a real-life situation, but wouldn’t simply giving in to the operation be enough to say that you are conforming to everyone else’s beliefs? Basically, by accepting this operation, you would be indirectly admitting that beauty and fitting in is your main priority. If you valued your uniqueness and independence, then undergoing this operation would be out of the question, right? I was going to mention this series in my post on unnatural beauty! I loved these books. I think they really capture a problem we have as a society: this unnatural obsession with beauty at the cost of much else. We act stunned that this "dystopian" society could exist, when our society in fact has ideas that are very close to those of the society in Uglies. Plastic surgery is already a widely accepted practice, and I believe the reasons it isn't more common are 1. the expense, and 2. the dangers involved. If we could easily, cheaply, alter the way we looked with no risk, why wouldn't we? This fictional series takes this question one step further and adds the notion that if you have this surgery, you lose free will... but if you alter your image so extremely, couldn't you say that you've already lost your free will and given in to society's concept of beauty, disregarding nature and your own self in order to fit in? I agree that our society is very close to having this same disturbing mindset. I think that these books play on a very big problem in our society today—that people strive for unattainable beauty instead of appreciating how they look naturally. The media pressures people to have a flawless appearance, splurge on cosmetics and even get plastic surgery. Like the books, it is becoming more and more popular for children to get plastic surgery as a way to transition into society—we already hear about people getting nose jobs for sweet 16 or bat mitzvah presents. The mind control in the books could reflect how the media influences society to think that they should look and act a certain way. I don’t think photoshopping and plastic surgery are the causes of anorexia or bulimia. They simply make it easier to alter how others perceive you physically. Especially if the lesions were left out (I loved this series as well), I would definitely get the surgery. First of all, it’s free. Secondly, not only are Uglies treated as second-class citizens, they aren’t allowed jobs or a future until they receive the operation (your first paragraph says it’s an “option,” but I disagree). I believe that by undergoing this procedure, one wouldn’t be shunning their true colors, but finally being granted those “inalienable” rights that we take for granted in modern society. And I don’t believe that could be seen as wrong. If it was just a matter of fitting in, I would abstain from the surgery. Let’s be honest, I of all people would flee to the Smoke in a heartbeat. xoxo,GossipGirl, you are correct about photoshopping and plastic surgery not being the causes of anorexia and bulimia. That was a mistake on my part. However, the influence set forth by the perfect images that are produced by photoshopping and plastic surgery could definitely be correlated with causing anorexia, bulimia, and other negative self-image disorders among men and women. You are also correct about it not being an option, my bad. It has been a while since I've read the series and I just looked up the summary on Scott Westerfeld's website: Yes, everyone gets the surgery when they turn 16, no matter what. This is why you must run off into the Ruins in order to escape getting the treatment. However, the "fitting in and feeing to the Smoke in a heartbeat" may be tougher to be certain on. Again, being raised in a society that has only ever known this surgery, tends to be something that all teenagers look forward to with great anticipation, and not knowing about the brain lesions taking away your opinions would be hard to rebel against. This society has pushed the idea of "everyone works together; one for all and all for one", so valuing your independence is sort of unheard of. However, obviously there are exceptions to this theory, (Tally, Shay, everyone else at the Smoke,) but it is tough to say for sure in this completely different setting from our reality. Though I have not read this series, I find the plot and issues it presents very intriguing. I feel like cosmetic plastic surgery has become such a larger and accepted part of society today. Whether we accept the practice or not, our own perceptions of beauty are being altered. I think it's so interesting how the book creates this interesting tradeoff for the surgery: the lesions in the brain to promote compliance and avert conflicts (read the wikipedia summary). This is much like society today, where people choosing to undergo cosmetic plastic surgery are trading off a piece of their own individuality and succumbing into society's standards. It would be interesting to note that we are getting to a point where this would be a reality for many women out there. The pressure to be more "beautiful" is not only triggered by a sense that women must be more attractive to get a man, but more so for self-esteem. A study conducted by BBC news showed that two thirds of women they surveyed wan plastic surgery because they were unhappy with their bodies. It's the reasoning behind getting plastic surgery in the first place. If a person was happy with how he or she looked, why would they change? It is nice that the author of the book made the tradeoff so subtle to his audience, but literal enough so that as the audience grows up, they would understand what he meant. The price of conformity is one's own individuality. I believe that science is a truly wonderful thing, but it must be bounded by ethics. As technology gets more and more advanced, the question become less of , "Could we do this?" and more of, "Should we do this?"